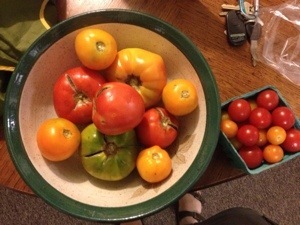 Heirloom tomatoes… Weird | ReLocavore: Redefining "local"
I get the heirloom tomato craze. Heirloom tomato plants are hardy and disease-resistant, and the fruits are colorful and flavorful. However, there’s something to be said for boring-old red tomatoes. I mean… look at how WEIRD the heirlooms look when you can them! 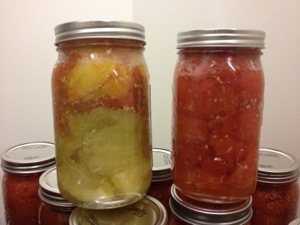 Categories: Farms and Markets, Putting Food By | Tags: canning, green tomato, heirloom tomatoes | Permalink. I think they are lovely. But I cannot imagine chicken cacciatore with yellow tomatoes. That would be so wrong. And in so many ways. The black and red ones are frightening to me. I cannot imagine biting into one. But I would close my eyes. Sam said the black ones (which are really dark purple) would go good in Chili. I’ll probably use the weird tomatoes in curry… That’s orange and yellow already.